Members of a north-east running club are to make their way across Scotland, from coast to coast, in aid of two worthy charities. 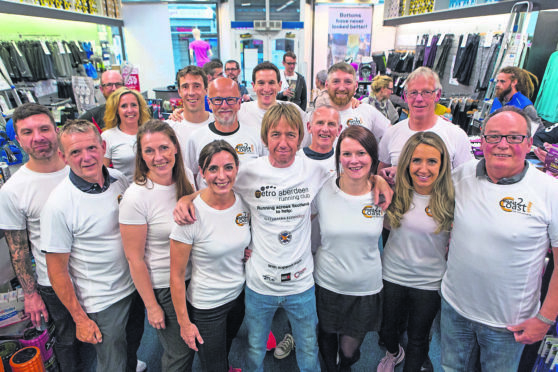 Tom Brian, men’s captain at Metro Aberdeen Running Club, came up with the idea for the relay event to foster the club’s team spirit while raising money for Braemar Mountain Rescue and the Gathimba Edwards Foundation. The foundation was set up by city man and athlete Myles Edwards with his friend and Kenyan international runner Gideon Gathimba. The fundraising challenge will start on the afternoon of Friday June 15 with some of the junior runners from the club dipping their toes into the North Sea at Fittie, before heading up into the city to rendezvous with the senior members at Duthie Park. From there the baton will change hands for the first time, with members of the club taking on the 165 mile route in groups and over 18 legs – ranging from 5 to 20 miles at a time – along city roads and over mountain paths. The Metro runners will head along the Deeside Way passing through Aboyne, Balmoral and Ballater before continuing on to Braemar and heading through the mighty Lairig Ghru to Aviemore. Their relay will continue along Scotland’s newest long distance route, the East Highland Way, which weaves its way through Kingussie, Newtonmore, Laggan and Spean Bridge before ultimately ending up at Fort William on the Saturday evening. The event has been six months in the planning and the club has set itself a target of raising £2,000 to be split between the charities. Almost a quarter of that target has been achieved already, with the event still weeks away. Sponsors Global Energy Group, BEAR Scotland, Run4It and Active Root have allowed the club to cover the costs of transport and some of the kit required, meaning all the money raised from the public will go to the charities. At a launch evening hosted by Run4It Aberdeen, Tom said: “The enthusiasm from our club members has been overwhelming and what started out as a simple idea for a club run has turned into an exciting weekend event and a brilliant fundraising opportunity for two great causes. To donate search for Metro Aberdeen as the fundraiser on totalgiving.co.uk. For updates on the event, visit metroaberdeen.co.uk.